Raederle: Is eating carrots the same as eating sugar? Is eating carrots the same as eating sugar? Question: "I have read that baby carrots are like eating 1-2 tablespoons of sugar. Do you agree with this?" There are four different phases that the plant goes through. Sometimes there are three phases, and sometimes brown sugar is actually white sugar with molasses added. Regardless of which refinement process was used, the end product is refined, and the beginning product is a whole food. 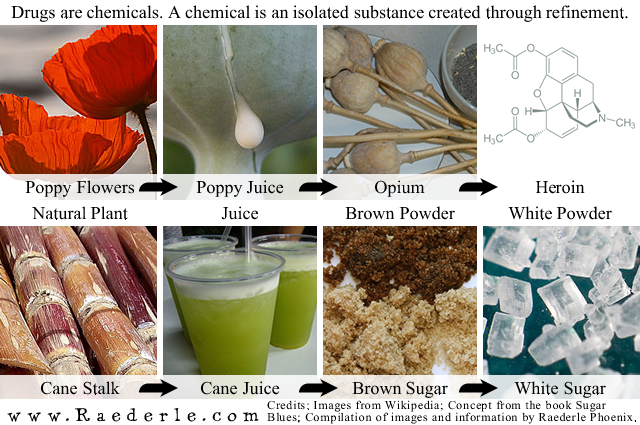 The first phase, "sugar cane", is natural and normal. It is also delicious just as it is. The vast majority of plants are edible and okay for human consumption before refinement, while they're still a whole food. It's the same process, but with a different plant. Anything that goes through that much refinement becomes purely chemical. It is no longer a food... It becomes a drug instead. Baby-cut carrots are not refined. They're just put through a machine to take off the skin and give them that rounded shape. They're the same as big carrots, except skinned and sometimes soaked in a chlorine mixed with water. The chlorine soak is not ideal, but its an effective method for killing bacteria. The tiny amount of chlorine you might consume from carrots is much less than you'll get from drinking tap water, and it is not nearly as concerning as consuming refined white sugar. Carrots contain a lot of beta carotene as well as fiber. White sugar contains no nutrition whatsoever. Even if carrots are pretty sweet for a vegetable, they're a long way from pure sugar. You can eat all the carrots you like and never worry about gaining unhealthy weight. Get more information on healthy living by entering your name and e-mail below.